A couple of years ago I worked with a grade 2 student named Joshua! Together we constructed a social story to manage the self regulation of his thinking to help him focus on learning. The example was described in Butler, Perry & Schnellert’s new book Developing Self Regulating Learners and talks about the process we went through to support Joshua, his educational assistant and his teacher. Here is the book Joshua and I wrote together. And check out Chapter 10 for more info! Remember this game!? it has been around since 1979 and is still going strong! For those of you who aren’t familiar, here is the gist. The good news is that is has evolved from 24 white people with chubby cheeks and towards little more of a diverse crowd. This game is a great game for developing skills like asking questions, but also visual referencing and comprehension. 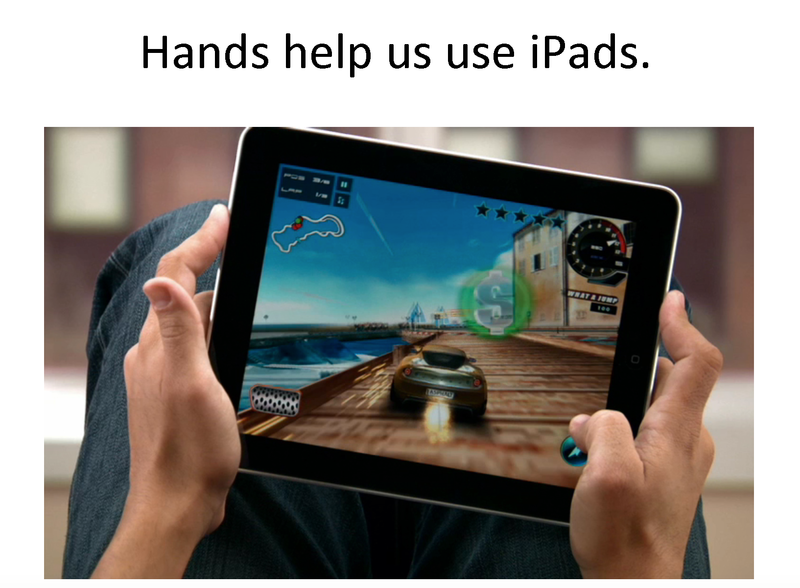 It’s manipulative nature and little words also makes it vary accessible to a lot of the kids that we work with. Because of this, we incorporated this game as an activity in our “ALL ABOUT ME” unit, which we implemented at the beginning of each year…with one little modification. Who says we need to ask questions about chubby white people, when we can ask questions about EACH OTHER. We changed every person on the cards, into a person in our school. Our Guess Who game went from a generic boring irrelevant game, and into a situated, authentic and fun way to learn more about each other, while still developing some of the skills mentioned above. The student love seeing pictures of themselves on the playing cards. We just took pictures and taped them directly to the cards. 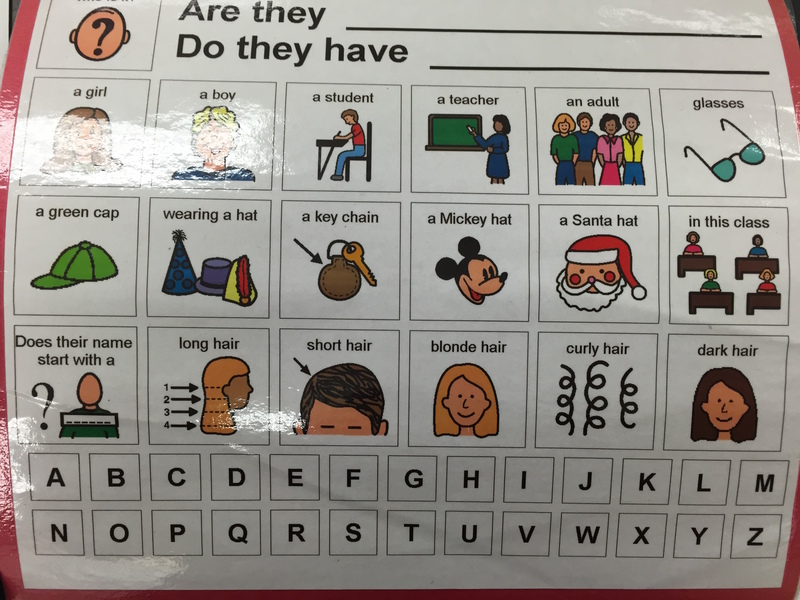 For students who need communication support, with a visual board developed specifically with the students features in mind. 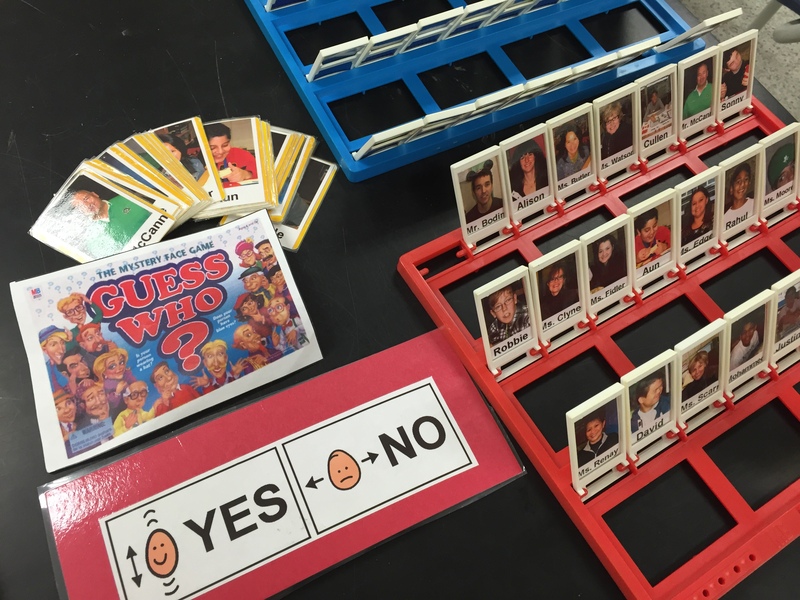 We included both students, educational assistants, teachers and administrators on the board, with the intention that this game would also help students with conversation starters when interacting with people in real life. An easy activity, that the students LOVED! AND you can often find these games for cheap at second hand shops or craigslist. 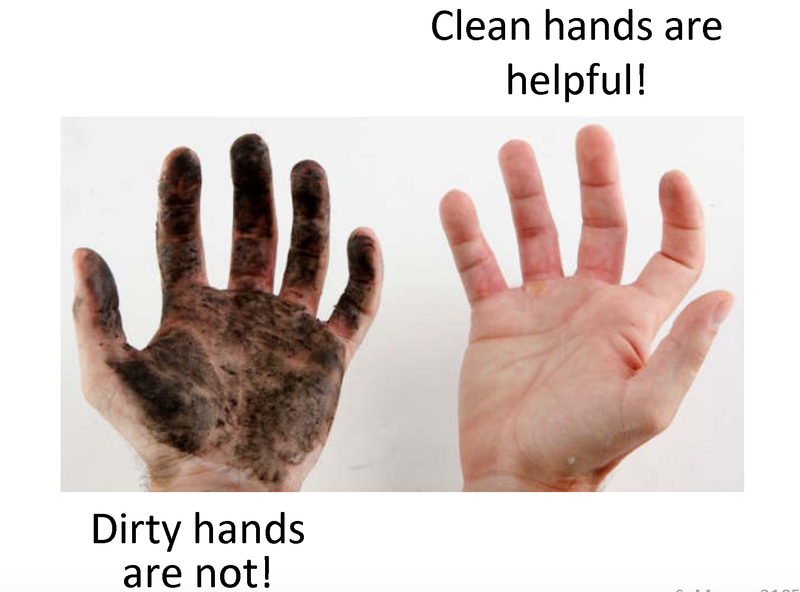 In a safety plan meeting last week, we discussed how this student, B., has a lot of behaviours that escalate, into a power struggle when staff ask him to wash his hands before eating, or before using technology. As a team, we decided to add hand washing to his list of behaviours to teach in his program plan. B., his team, and I had a photo shoot and we got to work creating him a book he could read, as well as build a consequence map. These resources were used by both B. and his team, to use as a teaching tool, and a reinforcement strategy. Step 1 of inclusion is teaching skills to help students be a part of the physical community of a classroom or school! This book is one of a series created to teach behaviours around being at school and in classes specifically for a student named A. 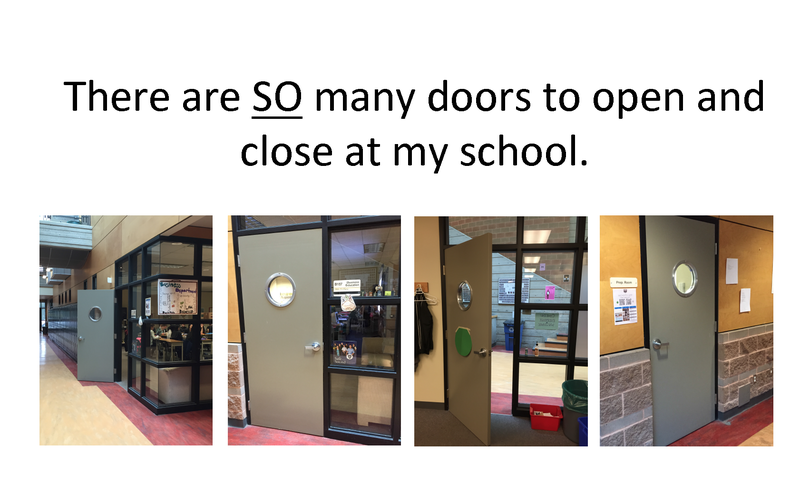 A. is a grade 8 student who loves doors! 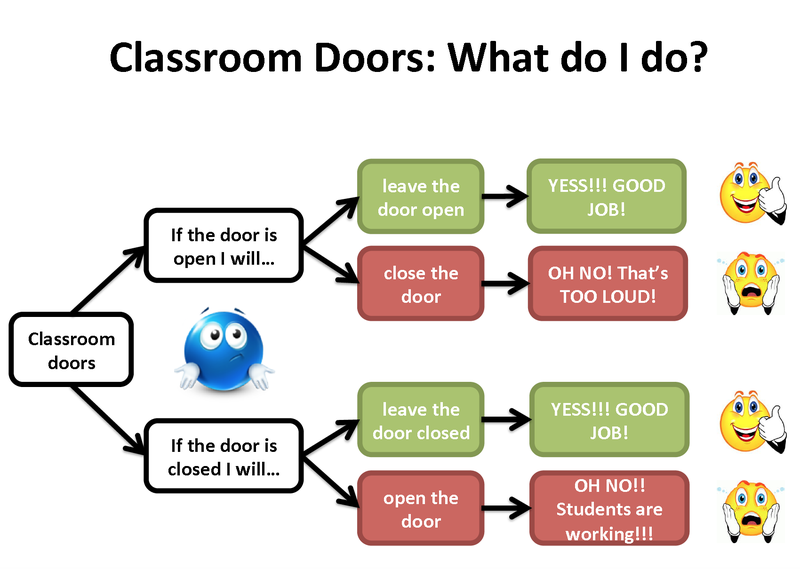 As A. walks down the halls of his school, he likes to open and close doors…which, as you can imagine… drives both teachers and students nuts. So rather than just never letting him walk in the hallways, A. and I wrote this book together. A and I had a photo shoot and together, as a part of his program, him and his staff read it together and practice. We used a visual consequence map to help, which his staff carried around with them in a binder, to help A. when he was stuck. Or as a reinforcement tool, in case he exhibited the behaviour after it was taught. Around the province, I have been fortunate to work with a variety of teachers, educational assistants, teacher candidates, and school teams! Over time, we have started to collect examples of differentiated unit plans with varying subject and grade levels. The best part, however is the EVERY SINGLE example includes a learners with a developmental disability. So, together with a collection of brilliant educators, there will be a new link on this blog called “Differentiated Unit Plan examples” to look at, which provide real life classes and scenarios of how schools have made the curriculum both accessible AND challenging to meet the needs of their diverse students. 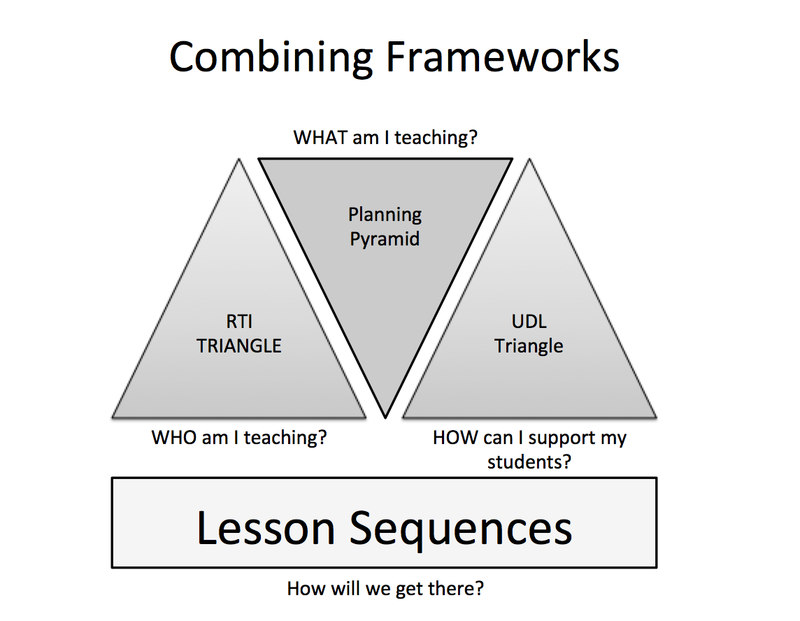 These examples are built from the “Curriculum for ALL” facilitated collaborative professional development series, and is based on frameworks wring together which include: Class Profiles/Reviews, Response to Intervention, the Planning Pyramid, Universal Design for Learning along with many others. This is a BIG shout out to the generous teams who have agreed to share their examples. Please note, that student names have been replaced with pseudonyms to protect privacy. Language Arts 1/2: What do good writers do? 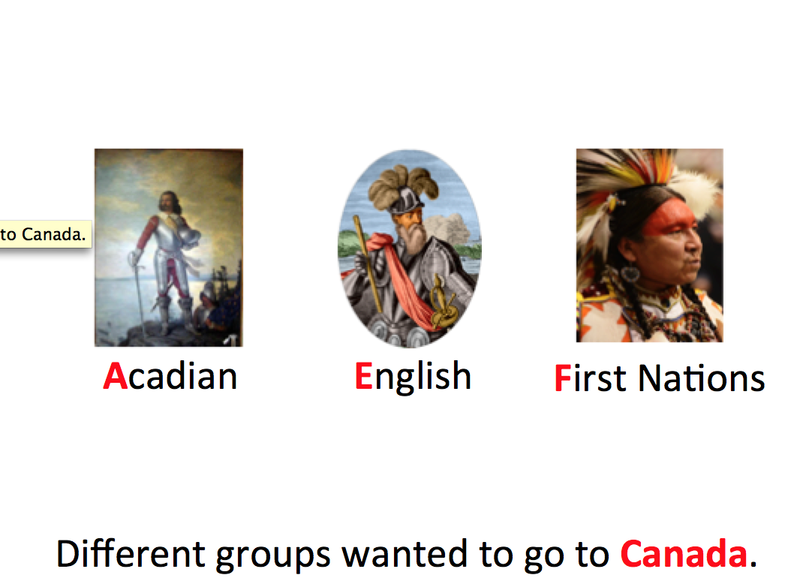 I had the opportunity to collaborate with Linda Watson, a Humanities 9 teacher, and together we planned the unit: Arrival to Canada: First Contact. What were the consequences of their arrival? For Lisa and Jack, the 2 student who were modified in the class, their goals were to answer the first 2 questions. As a part of a text set, I wrote a book for these 2 students with the information they need to answer the questions. To incorporate literacy, as an extension activity, the class also had to prepare a mind map of the information. A scaffold was made for students, as well as a template built into the book for Jack and Lisa. We learn about many different people in our schooling lives. An easy way to make this accessible for students with disabilities is to explore where these important people are from. 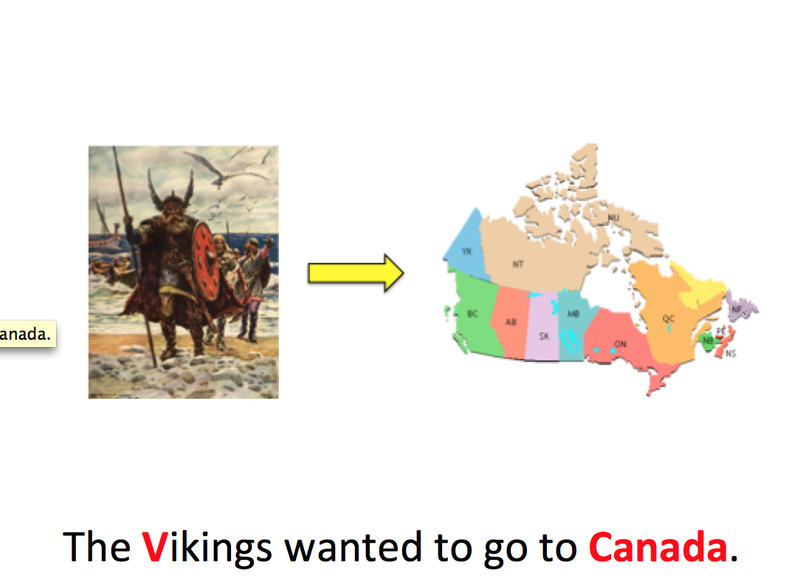 This Social Studies class was learning about Louis Riel, for Dustin, his goal was to learn about where Louis Reil was from…Manitoba!!! There are fascinating facts about Manitoba that could also help other students connect with, that are engaging and a great hook, like hockey, Winnie the Pooh and polar bears! This could be done for many people: Shakespeare, Stuart McClean, Lois Lowry or even Obama! Everyone is from somewhere, and this book can be used for any province or city. A great template to use for students who are modified in content classes. This social studies 10 class was learning about supply and demand, for Sharon, however, her goal was to understand and differentiate the concepts of buy, sell, craft and goods. This also happened to be the the first lesson for everyone in the class. A great strategy for teachers who want to create accessibility and build background knowledge at the same time. Spending time on this foundational, otherwise assumed, background information, proves helpful to many students, not just those with additional learning needs. Although Sharon stayed with this goal for the unit, the rest of the class built on from there. A much easier strategy than teaching and then trying to simplify and retrofit curriculum after its been taught, or trying to modify a lesson on the fly. This book was used to support Sharon learn the new information. The book has been differentiated for multiple learners, words in red are at an emergent text level and words in black are transitional text level. I didn’t know this, but the Periodic table of elements is not just about memorizing symbols, numbers and formulas, there is actually a big idea to this coloured chart! This book is about the big idea of organization, and how it is applied to the scientific elements. The book is written at two levels, at the conventional level for reading out loud to James, and at the transitional level for James to read independently. To differentiate the difference, James knew that his words were red. If only I knew this information back in high school, what a good reminder about how teaching to big ideas can help us connect details that can sometimes get lost or forgotten. Let me tell you…. all, the students in the class were fighting over this book! There are great resources already out there in terms of age appropriate and interesting texts at levels accessible to all types of learners. One of those resources is News2You. News2You publishes a weekly unit on engaging topics and current events. Based around differentiated texts, this resource also develops extension activities. One additional aspect that I wanted to include, however, was a lesson that helped me see what my students already knew about the topic. With many of them having so many gaps in their learning, a background knowledge lesson also helped calibrate the group and get everyone on the same page. In keeping with the inquiry theme, I tried to develop a prior knowledge activity adapted from the KWL strategy (What do I know, want to know and what did I learn). Using the pictures as visual supports, students chose pictures that finished the sentence, ‘I know that Monarch Butterflies…..’ At its most basic, this was just a choice activity. But as I scaffolded the lesson, picture boards contained additional distrators, or students had to find pictures and words on their own. If additional challenge was needed, I asked students to think of their own responses without visual prompts. Once each student had a collection of pictures and words to describe their thinking, they made a title page for the unit. By the end of the lesson we had a compilation of title pages filled with words, pictures, symbols which all met the same goal! Inclusive Education: It's not more work, it's different work!